Every job has its monotonous moments. And when every day is the same, most people get bored. But the opportunity to spearhead new projects brings excitement and purpose to any job. These initiatives make you look forward to Monday mornings. The field of IT can sometimes involve many repetitive tasks, so it’s an absolute joy when you get to innovate. At Lucozade Ribena Suntory (LRS), we’re all about innovation. LRS is one of the top soft drinks manufacturers in U.K. and Europe. GlaxoSmithKline recently sold Lucozade Ribena to a Japanese group called Suntory, so Lucozade is part of the European side of Suntory groups, called Suntory Food and Beverage Europe, SBFE. It’s clear, due to the acquisition, these companies have always looked for new ways to evolve and grow. That’s why innovation throughout the organization is still so critical to the new, growing company’s success. Luckily, in IT, we have a work environment where creative, original ideas are encouraged. And it has already changed the next iteration of LRS for the better. Our IT manager, Richard Clifton, is the kind of guy who pushes you to take your good ideas and apply them to the company’s operations. The goal is to improve how we work. If your idea would help the business, he’s all for it. And he’ll let you lead the entire project, however that may unfold. Working within a supportive environment encourages our team to continue to look for ways to add value to the business. One of the most recent areas where we saw an opportunity for improvement was in the way we handled our office visitors, which clearly needed an overhaul. Employees would send emails to the reception desk, telling them who to expect and when. Reception would collect the information from the emails, input it into a spreadsheet, print it out every morning, and place it on a clipboard for visitors to sign upon arrival. The process didn’t exactly scream “modern.” When the visitors arrived on site, reception would have to search for the host. It was an entirely manual and cumbersome process, and inconvenient for both reception and the visitor. This process made any attempt at analysing visitor data extremely difficult. Reception occasionally needs to review the numbers, such as how many visitors arrive, who receives the most visitors, and the like. We also receive visitors from our sister companies across Europe, from locations like France and Spain. If they need that data, they would’ve had to go back to those printed paper sheets. I analysed the whole system for areas where we could improve. The IT-reception crossover may sound surprising, but innovation knows no limits nor department silos. I realised we could improve the system by implementing a solution that would be helpful to the reception team and make their lives easier. Those were the series of catalysts that motivated us to search for a tool that could change the way we manage visitors. I started by asking my friends, who work for some large corporations, for their recommendations. I looked for a solution that was user-friendly and secure. When they couldn’t recommend a system that met our needs, I searched online for different systems. That’s when I discovered Proxyclick. Proxyclick is a visitor management system that works by installing an iPad at reception with the visitor registration software pre-loaded. As a visitor arrives, they type in their information following the simple steps outlined. It even takes their photo for a name badge that prints out immediately with their relevant information. Once they’ve signed in, the host gets a text message, an email, or a message on Skype for Business telling them their visitor has arrived. From there, they can reply with standard messages and say, "I'll be in there in 5 minutes." You can even type your own message so it’s fully customizable. It’s much easier and quicker to locate the host as well, so visitors don’t become frustrated as they bottleneck in reception. From a usability standpoint, Proxyclick seemed like the perfect solution. One of the main things that drew me to Proxyclick was the secure user import process through Okta—an adaptive, single sign-on, multi-factor authentication system. The systems are connected, so you don't have to do anything manually. Other systems typically deploy AD Sync or require you to download a spreadsheet for AD, which contains all users’ information. That's not ideal for our needs because the spreadsheet essentially contains all your user data, even if it's simply phone numbers. Proxyclick is, by default, more secure. As we looked to implement Proxyclick, we had to enlist the infrastructure team too, because they’d be the ones managing the system. I knew we had to collaborate with their team, since innovation cannot exist in a vacuum. It requires collaboration and information sharing. I then spoke with my infrastructure manager to get the details on what system would work best and why. I needed to confirm I had found the right tool. Next, I interviewed the reception team and facilities director to discuss their pain points and ensure the potential new solution would meet their needs. Finally, I spoke with Proxyclick, enquiring about a free trial. I needed all of this information in order to build a business case for this potential new platform. Once I compiled all of that information, I created a PowerPoint deck, highlighting the Proxyclick solution, how we can implement it, and the potential for return on investment. I called a meeting with my IT team, including my team lead and IT manager, and shared the final deck with them. They were instantly on board and, from there, we decided to present our case to the business. Naturally, they saw the value in Proxyclick, and we started to move forward with the implementation. We began our rollout by installing the product on a few iPads, building the enclosures, and setting them up to align with the way we already did visitor registrations. We knew we had to run preliminary tests to see Proxyclick in action and ensure the process functioned as it should. We even bought the printer to complete the set after implementing and properly running the demo. It was if we had already started using the product. This gave us a better idea of how it was going to help and what kind of adjustments needed to be done. This was one of the best decisions we made. When I needed to further customize the system, the Proxyclick team was incredibly helpful. There was a chat widget on the site where we messaged them and, within minutes, they would reply. From IT’s point of view, Proxyclick’s ongoing support was invaluable. Our demo gave reception—and the rest of the business—adequate time to get comfortable with the new system. When we went live, there were no problems at all. We’ve also received glowing reviews from our visitors. One of our regular visitors told us he loves the new system. Implementing Proxyclick in reception was quite easy, but on the factory side it was a little more difficult in comparison. The factory side of the onsite visitor system was more complex because their sign-in protocols are also a bit different. They must pre-register any visitor at our headquarters because it’s our manufacturing site and it needs to be more secure. Security will not allow entry to anyone who isn’t pre-registered. The factory staff were more reluctant to move to this system than the reception and security teams, which caused some roll-out delays. 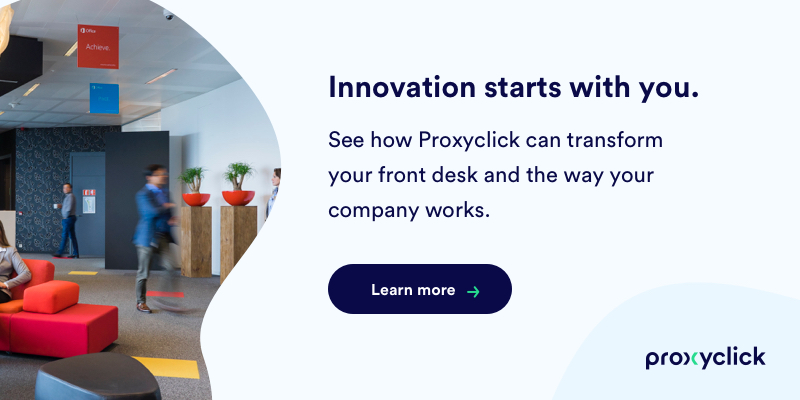 But once Proxyclick went live and they received some training, within a day I had once-skeptical employees telling me how happy they were with the new system. Proxyclick also helps our finance team keep track of the attendance and work schedule of individuals who charge the company for their services, like contractors, who regularly move between LRS sites. The new registration system allows them to pull reports showing specific days on site and even what work was done. This data enables them to make smart business decisions now that they have more information available. I’m trying to simplify it even further on the factory side, where we get between 80–90 trucks entering and exiting the factories every day. Since their drivers have a different process to follow when coming on site, I’m working to include their procedures in Proxyclick to optimize that process. We can give Proxyclick access to the company sending the trucks, so they can pre-book the drivers into our system and track the drivers coming in. They can enter the vehicle registration number as well, which further assists the onsite security team. It might not be able to give them the exact timing of the trucks coming in, but they will know who is coming on which day. Finally, from a security perspective, it’s become much safer now that we have a definitive list of who’s on-site with a better idea of where they might be on the grounds. In case of an emergency, such as a fire, our security team can refer to the emergency list available on their mobile phones through the Proxyclick app. And the changes we’ve seen are just the beginning. We’re early in the process, but Proxyclick has transformed the way we handle our visitors. Our new system has even freed up one whole staff member from her reception duties, so now she’s able to help elsewhere. All because we searched for a way to add value—and found it. For me, I’m now able to take on more leadership and project management roles as a result of our success with Proxyclick. As an IT Support Analyst, I’m further leveraging my skills to support the business in its day-to-day operations in addition to bigger projects across the company. Empowering employees to take on innovative and creative projects will almost always lead to an opportunity to add value to the business. Sometimes, you just need to look in the places you least suspect. 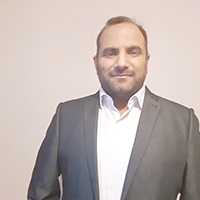 Muhammad is passionate about innovation and helping business find new technology and solutions to increase their productivity. When Muhammad’s not at work, you’ll find him learning more about new technology, deepening his knowledge of politics, fundraising, volunteering and playing cricket.